What a month. First of all we get Theresa May’s Brexit 12 point plan, a.k.a. rebranding Great Britain as Global Britain (despite its lack of resonance with voters). Next we get the Trump inauguration. Then we get Trump’s hyperactive first two weeks. Never mind the hackneyed First 100 days of a new POTUS – Trump has done more damage to the USA’s overseas reputation less than 14 days into the job than Bush / Obama / etc managed in their first year. Amidst all this the equity and bond markets have struggled to form a view. 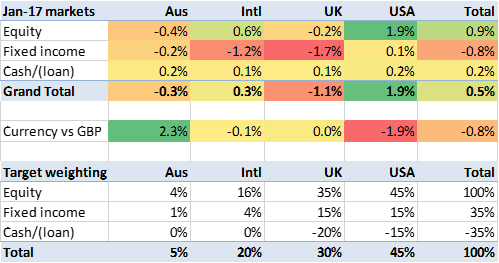 USA equities are up a bit, UK bonds are down a bit, not much else to report. Phew. The USD has fallen a bit, thanks to concerted talking down by Trump and his putative administration. They are accusing China of being a currency manipulator (which appears to be broadly true, albeit in the opposite direction to their claims), Germany of being an EU hegemon and currency abuser (for which there are quite good arguments, so I watch this meme with interest) and Mexico of, well, I’m not even going to go there. For some reason the AUD has risen against the pound. I’m not sure why. Combined with the USD fall this is quite a big shift in the terms of trade between Australia and the USA. Overall the forex markets gave my GBP-denominated portfolio about 0.8% of headwinds. In their local currencies, weighted by my target weighting, markets rose by 0.5%. So if I track the markets correctly I should be down by about 0.3%. How did I actually do? In fact I was up 0.2%, beating my market index by 0.5%. Why was this? I’m not really sure; I am overweight US (by 3%) and underweight UK (by 7%, thanks to too much gearing) and I think this is most of the explanation. My 1 year performance is up 27%, which is a reminder of how extraordinary 2016 was. But my ‘since inception’ average has dropped a bit to 12.7%. No grumbling here. I believe most of the move in AUD was prompted by multi year highs for Australian trade surplus numbers on the back of spikes in bulk prices (iron ore, coal).